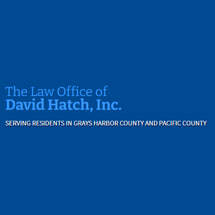 The Law Office of David Hatch, Inc., in Montesano is a long established law firm providing experienced representation primarily in the area of criminal defense for people charged with DUI, DWI and other misdemeanor and felony offenses in Grays Harbor County and Pacific County Washington. "I do not judge you for your legal circumstances. I listen as we discuss your situation, and together, we will pursue the most effective strategy for a successful outcome." A former judge for nine years, attorney David Hatch founded his law firm based on the philosophy that everyone is entitled to vigorous, effective legal representation and equal justice under the law. He is recognized by prosecutors and judges for practicing with integrity. He is a straight shooter and works aggressively to help his clients get the best possible outcome for their charges. He wins cases on their merits. He offers one-on-one attention and individualized strategies for every client. Mr. Hatch is rated highly on AVVO and has earned a Martindale Hubbell rating of BV for his high ethical standards and offers efficient, cost-effective advice and representation. He offers a free initial consultation.